Jeff Cardille at the University of Montreal has a project METALAND that is eveloping more sophiticated ways of characterizing landscapes. He presented some of his work on archetypical landscapes of the USA at the current Ecological Society of America meeting. What is the typical landscape of the United States? Jeffrey Cardille, of the University of Montreal wondered the same thing. He may be in Montreal now, but he’s from the US of A, and a big Woody Guthrie fan. Guthrie, in his alternative national anthem “This Land is Your Land” invoked the “redwood forests,” the “gulf stream waters” and so on. But could it be that the archetypal US landscape these days is rather a cornfield or a brand new subdivision? To find out, Cardille used an algorithm called “affinity propagation”, made famous in this Science paper by Frey and Dueck. As Cardille explains, the algorithm is “a way to find representative samples in complex datasets.” In the Science paper, it was used to create clusters of faces the same people out of a sea of photographs. Each cluster was organized around a central exemplar photo. 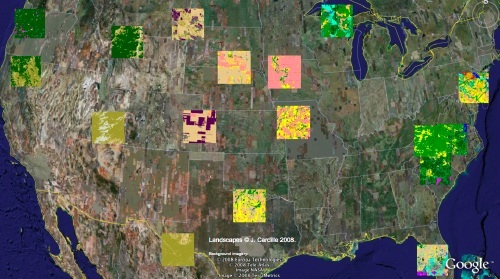 Cardille used the same method on landscape data from the National Land Cover Data Set, and metrics extracted from the dataset with a program called fragstats. He gridded the lower 48 off into 6 km by 6 km squares and then let the algorithm rip on the data—5% at a time due to computing power limitations. What emerges on any one of the runs are something like 17 exemplar squares, real chunks of the landscape that best represent the totality of the landscape. Predictably, of the 17 in the run he presented, 13 are human dominated—row crops, clear cuts, urbanizing suburban land, and the like. Two are carefully managed national parks. Just two are more or less running themselves. One of these is a square of the vast shrub-lands of Texas. Well done, I found this blog on google and found very intresting.